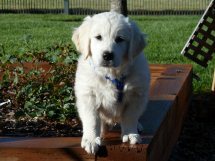 At Oregon Mist Goldens we strive to provide English Cream Golden retriever pups that are superior in quality and health and have stunning beauty with fantastic, calm temperaments. 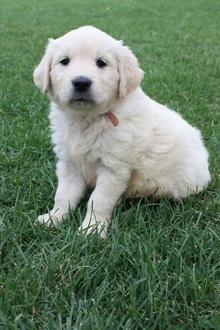 We also guarantee to provide our customers with a most positive, professional and happy experience with us and are here for the lifetime of each one of these beautiful Oregon Mist Goldens babies! Dover is such a loving and playful little fellow. He loves to be held, and he really loves to eat. He has been learning some commands, such as sit, stay, and come. He has been a great joy in our lives. Here are some photos I took yesterday. The fall colors had peaked a week or so ago, so they were not as vibrant. I put one of Tassie with Dover so she wouldn't feel left out. Thanks Judy. Hope all is going great with you and your family. 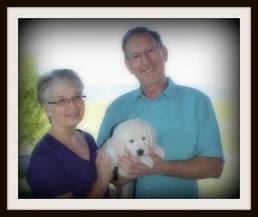 It has been over 10 weeks since we made the 10 hour trek to Montana to pick up our new Montana Mist puppy. 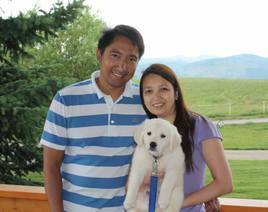 My husband and I left Calgary, Alberta, Canada on August 26, 2011 with a rather high expectation of our soon-to-be family member. Until now, we had not met Judy in person, nor had we been to visit her kennel. In fact we never even hand picked our puppy! Anyone who knows me personally, knows this was so not like me…. I have raised dogs all my life. I have bred and shown different breeds on and off over the past (how dare I admit this…) 30 + years! 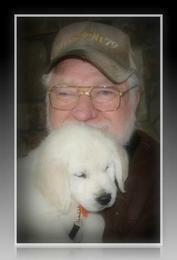 I am actively involved in the breeders and kennels I have chosen my dogs from. 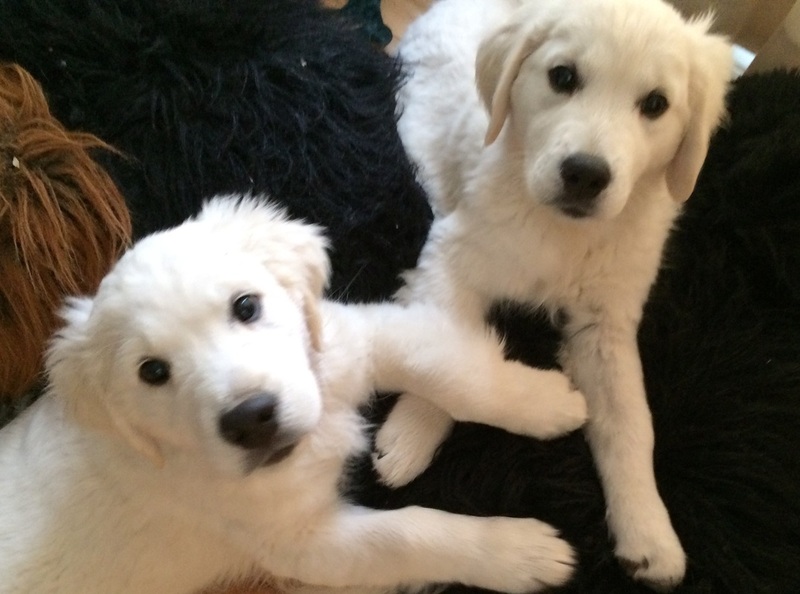 I research every breed and we are committed to having each puppy as lifelong members of our family. 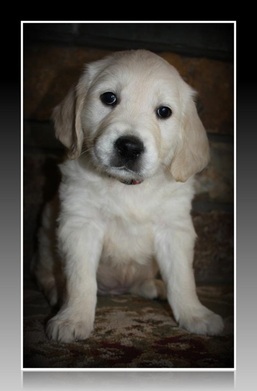 To go ‘on-line’ and find that special puppy is not me. To purchase a puppy - sight unseen, to never have met the breeder, to never have interacted with the parents of the puppy is just crazy! We were the proud owners of two American Cocker Spaniels. We purchased Mindy from a reputable breeder in Northern Alberta about 14 years ago. After showing Mindy, we had her bred and kept one of the female puppies. 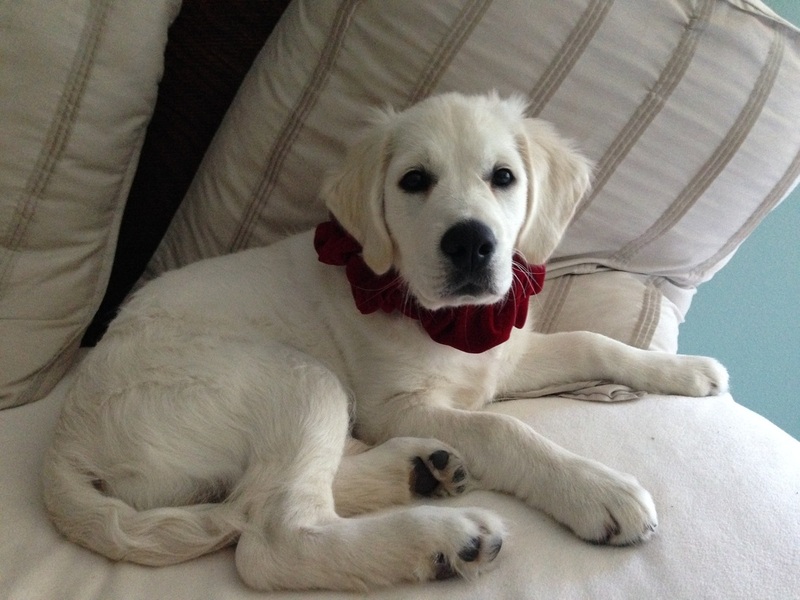 Sage was a beautiful puppy with great confirmation. She was ‘show quality’ however she was not as outgoing as a show dog should be. A show dog she would never be, but that was ok, because she was, and still is, an awesome member of our family. In July, 2010, Mindy’s health declined and we had to make the heartbreaking decision to have our Mindy put to sleep. I felt they were a little ‘more business’ than I would like. 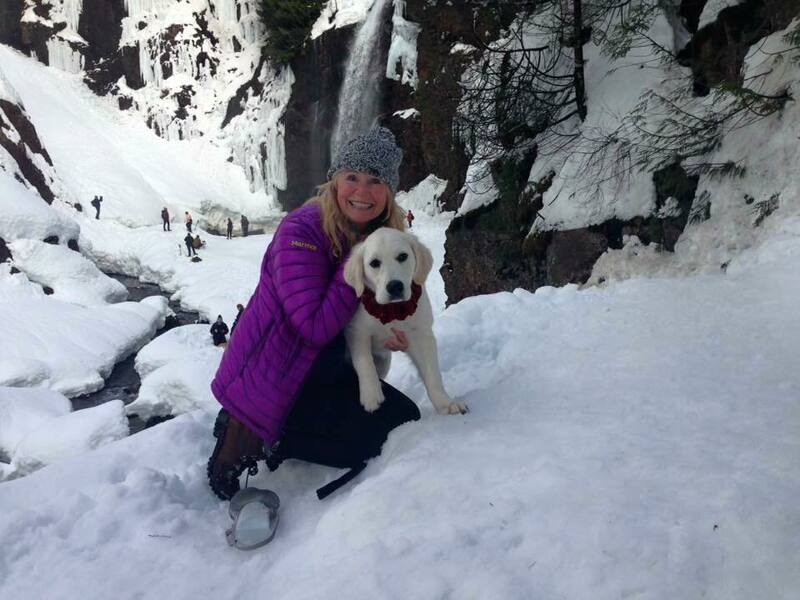 To make this rather long story a wee bit shorter, I finally found Judy Lowery at Montana Mist Goldens. In May 2011. I first contacted her via her kennel website. I then called her directly and we talked for quite a while. Not only did Judy answer all my questions, she also asked a few of her own. It was apparent she was not just trying to sell me one of her puppies, but was making sure both the puppy and our family were suited for each other. From the initial conversation, I was hooked. Before sending a deposit, I did go over her website, looked her dog photo’s, some family photo’s and the information on the breed. I love the page that shows the differences between the ‘typical American Golden’ and the English Golden. 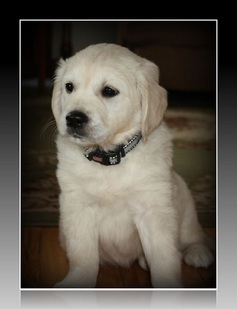 I spoke to her a few more times before sending her a deposit for #1 pick of a female puppy in her next litter. We found the breed, found the breeder and soon we would have our puppy! But now we had to wait until the puppies were born ~ and waiting is not my best feature! The waiting was made easier with the weekly updates and pictures of the expectant mother. The puppies were born on July 5, 2010 ~ 3 boys and one girl. 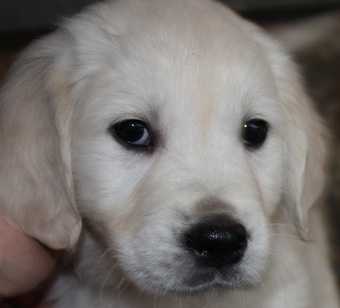 As there was only one female, we would be unable to pick out a puppy based on personality and type. However, by then I had so much confidence in Judy that I felt this puppy would be the right one. 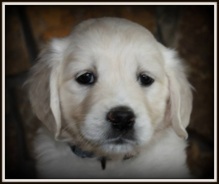 …and the waiting began again… We now had to wait another 8 weeks before we could bring our new puppy home. 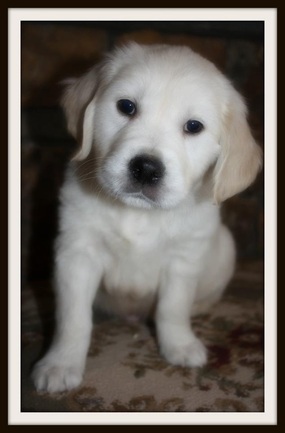 Once again, Judy made the waiting easier with weekly email updates and photo’s of our little girl. She also included some photo’s of the boys which was much appreciated. Through these photos and emails, I got to “know” Judy and her family. 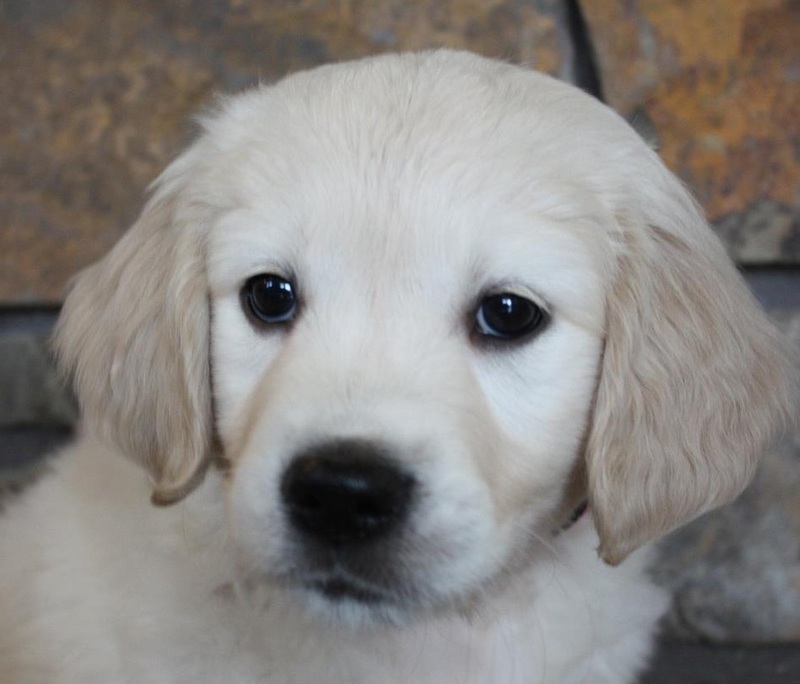 By the time we were finally able to drive down to get the puppy, I had absolutely no reservations about buying a puppy sight-unseen. Now I was having a few other reservations….. Our grandson was now more mobile and was crawling around. He visits us often and I was wondering how he would take to a young puppy. 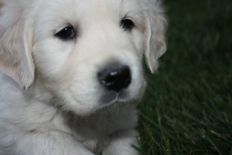 Would this puppy be very hyper? Would she knock down the baby, or nip at is feet while he crawls around? 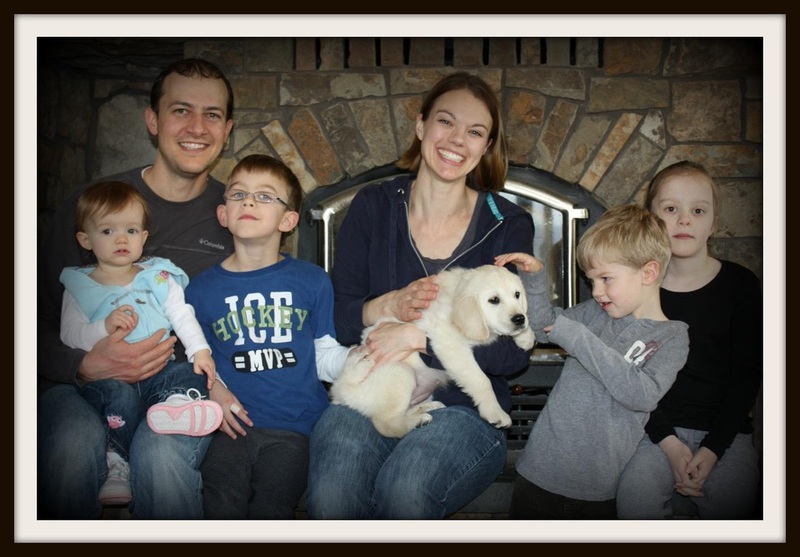 We were also expecting our second grandchild in November 2011. I had a lot to think about on our 10 our drive…….. I to her family as well as the puppies as well as the puppies parents. Ember & Troy were as beautiful as I expected. Of course our puppy was sweet and adorable as we expected. We named our puppy Savannah. We visited for well over an hour before going to our hotel for the night. We ended up staying and enjoying Missoula for the weekend. 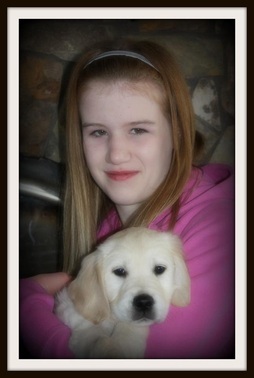 On Sunday morning, we went, finally, to pick up our new puppy. Judy sent us home with more than just our puppy. We were given a collar, leash, premium dog food, treats, shampoo’s, conditioner, vitamins and even some doggie cologne so she will smell good! Judy also made us a collage of puppy pictures on the front of the binder of dog information. 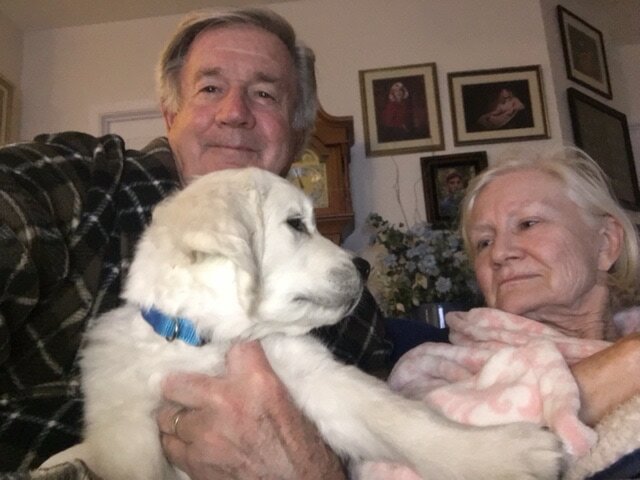 … and more importantly, Judy sent us home with the confidence that we made the right decision to purchase this puppy from another country, from someone I had never met…. This is something that I am sure goes terribly wrong for many people. In our case, it was a wonderful experience ~ one that I would not hesitate to do again. How is Savannah doing now?? She is really has exceeded all our expectations! She is great little traveller (of course a 10 hour long car ride on Day 1 probably helped her to become such a good traveller). She is soooooo good with our little grandson Landon. Right from the beginning, Savannah has had respect for him. She loves to just be able to just touch him. The minute he comes over, she wants to sit with him, just to be near him. 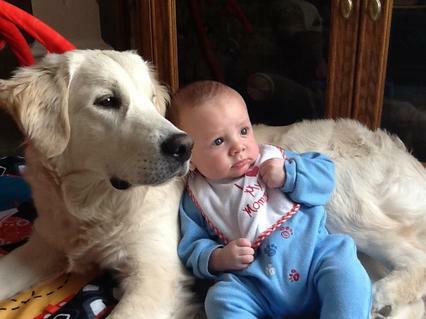 While she may try to occasionally lick him, she has never, ever tried to nip at him, or jump at him. Even when Landon as a cookie, Savannah will just lie down intently and watch him. She does not try to steal his food and will even sit quietly while Landon plays with ‘her’ toys. Sage, our 11 + year old Cocker Spaniel even likes her! Now that is something because Sage is not partial to larger dogs. There are times that Savannah gets a little carried away when she tries to play with Sage - but she has never tried to nip at her or bully our older dog. Again, Savannah does have lots of respect and seems to know not to cross that imaginary line. I have had many dogs through out my life - and I can honestly say that Savannah is ‘naturally’ one of the smartest dogs we have had. Don’t get me wrong, Savannah is still a puppy and being a puppy she does need a correction from time to time. She is not only a pretty puppy, she is turning into a beautiful dog. We are always getting complements on how striking she is. Not only that, but we are always getting told how calm she is and how smart she is. Recently, I had taken Savannah to the vet for her last set of shots. Seated in the office were two ladies with their dogs. These two dogs were a little on the wild side. One of the ladies said that my puppy was so well behaved at such a young age and what do I do to get her to be so calm….. It made me think about what does make such a good dog….. I do believe the foundation starts with the breeders. 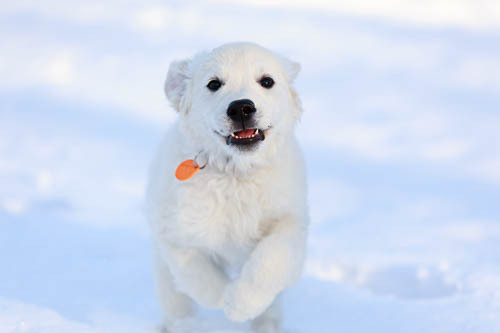 The breeders chose’s the dogs they will bring together based on personality, temperament, health and breed standard. They make sure the expectant mother is given proper nutrition and vet care. The puppies must also be given proper nutrition, good vet care, as well as socialization. 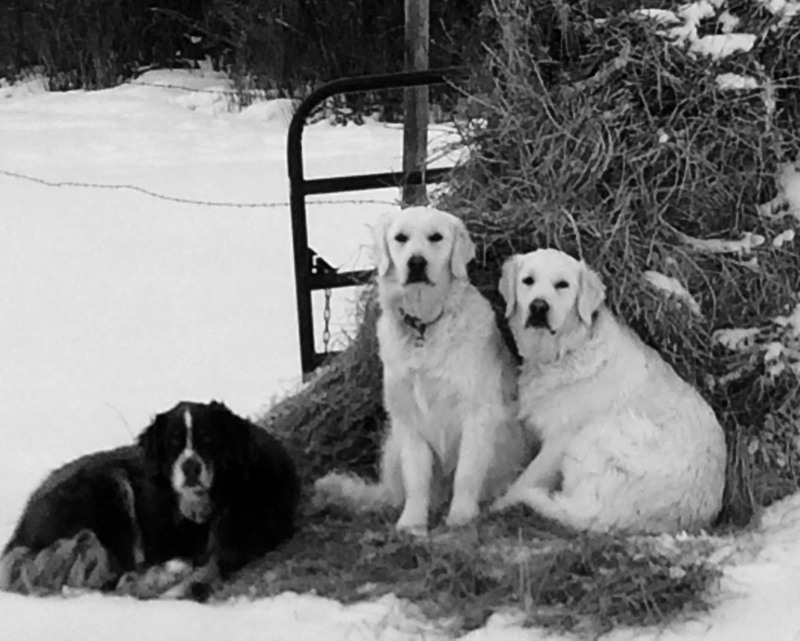 Not only does Montana Mist Kennels provide their clients with all of the above, they go far beyond. 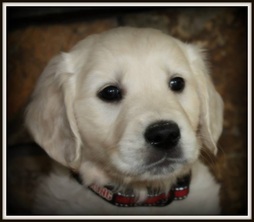 They are committed to providing their puppies the best possible start in life. By doing so, the puppies are ready to start on their new lives, as well adjusted members of a family. Today Savannah continues to be a healthy, well adjusted and well socialized puppy. She is incredibly smart and thrives on attention. She absolutely loves children! For Savannah, nothing would be better than to have her own little person to play with. (This is definitely accredited to Judy’s children!) It won’t be long before Landon will be running around the house, followed by our newest little grandson, Grayson, with Savannah at their heels. And before we know it, there will be a new little grandbaby (June 2012) to join in on the fun! When I started to write this, I expected to write a few paragraphs. It is longer than I wanted, but I really can not say enough good things about the quality, health and temperament of our puppy. 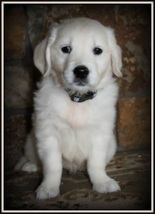 I would highly recommend Montana Mist English Cream Golden Retrievers for your next family member! Well, Maggie passed her Puppy Wellness Check with flying colors. The doctor commented how pleased she was with your preparation and support and I want to thank you very much for your attention to detail and help--Thanks. She's been home for 30 minutes now and already destroyed two of the chewy bones I had in her cage and hard at work on the third. I can see my bill for chewy bones is going to be a major expense!! ;) She only cried for about five minutes as I drove away from your home and has been quiet every since. So long and thanks a lot for your help. If you should ever need a recommendation please do not hesitate one second in referring them to me. I'll be glad to vouch for you 100 percent. My little Fanta is a beautiful and friendly sweet girl. She loves to give kisses and loves people. Fanta gets along with all of the other animals we have. I am enjoying playing and watching her grow up. I am so thankful I got a Montana Mist puppy. 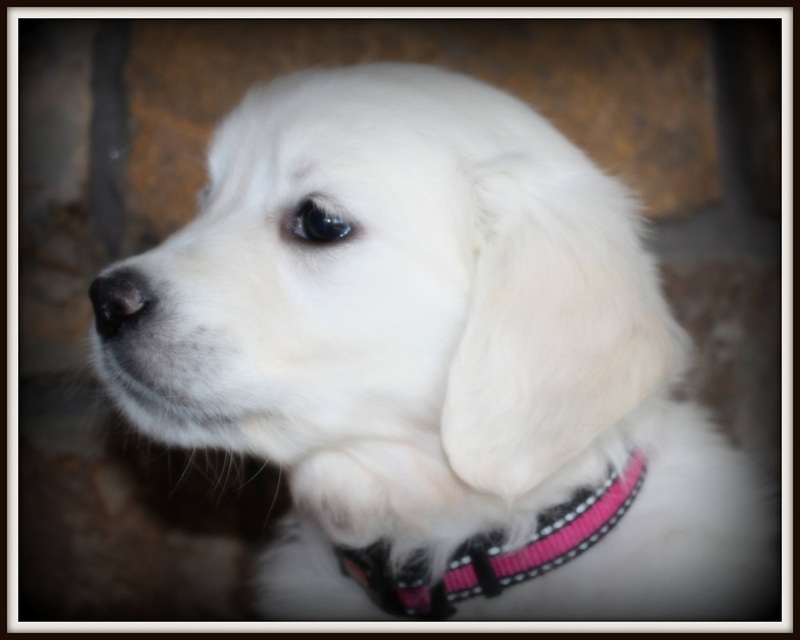 Here are a couple of pictures, but we will hopefully send you a few more close ups of Maddie sooner than later. She is a wonderful pup and doing fantastic. Well....except for going on walks and short jogs! As you can see from our picture, she has a certain affinity for being strolled or carried :o) Last night she did her first jog with me and made it one loop around our neighborhood (1/3 mile), with some little incentive treats of course! We are being careful to go slowly with her and certainly no farther than that for now until her little puppy bones grow a little more. She is learning to sit, especially before she receives her meals (which for her is a big deal, considering she inhales every bit of it like her last meal was days, rather than hours ago!). She is also learning to lie down, stay, off (usually from Annalise's high chair - a wonderful source of secret snacks! ), and her crate and potty training have advanced quickly. She loves to play, and we are really working to replace her mouthing of us, with her toys. We are having a lot of fun with her and really enjoy how much she likes to snuggle. She is such a baby :o) Loves to be tucked into her crate at night, then have one of us sit by her until she falls asleep (which only takes a few minutes) with her "lovee" (a washcloth). Hope you are all doing well and enjoying Spring! Finnegan is getting tall and is a lot of fun and already learning some commands and is really good with the potty training! Hello from Wyoming. After a very busy week last week and even busier weekend (our son turned 30 on Friday) I am just getting to your email. We are so excited to work with Cooper on more training. Thank you for the continued training updates as I feel that they are invaluable in our continued success in training him. 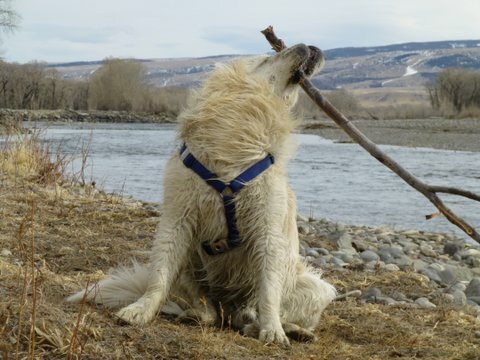 I did much research on breeds before deciding on the English Cream Golden and my husband and I continue to be amazed at Cooper's laid back personality, intelligence and quick learning ability. We are pretty sure that at almost 3 weeks with us he is almost potty trained (we know there will still be accidents) but he is going to the back door when he needs out! We take him for rides a couple times a week and he just lays down in the back seat and rides to our destination without issues. It seems that he just takes everything in stride and so far nothing bothers him. It would seem that as long as he is in the middle of whatever is going on with the "people" in his house he is just fine. I just can't express how happy we are that so far he is everything we were looking for in a pet and more! 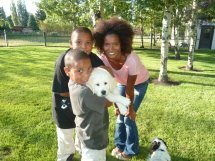 Oh and it goes without saying that the grandkids love him, you saw the picture of him and Zeke in the tub together :). Thanks again for all the helpful hints on training. I will be talking with you soon. Hi Judy, well I am the first to admit I'm a procrastinator! I have thought of emailing several times. First and foremost I want you to know that we absolutely adore Heidi!! 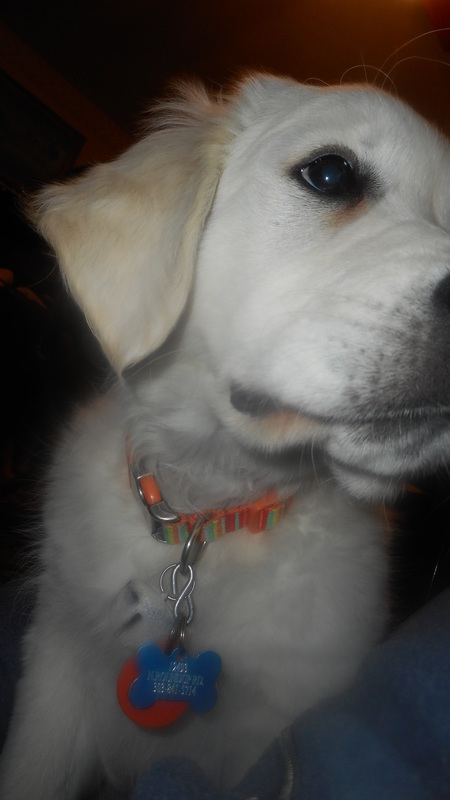 She is the best puppy for us. She is mellow with just the right amount of "puppy". So far she is the easiest puppy I've raised. So far she hasn't destroyed anything of value, chewing hasn't really been a problem and she doesn't seem to nip or bite much. She's house trained and rings a bell to go outside. She just seems to pick things up so easy it's like she understands english. She sits, shakes, and goes to bed on command. Seems to know food is coming if I say lunch, dinner or treat. And she retrieves if my other dog doesn't interfere. I have 1 other dog and two cats. They all get along really well and seem to hang together like a pack. She is still very food driven. If permitted I think she would eat the whole bag of dog food at once. I sometimes refer to her as Fräulein Heidi Hog Dog! I will send a couple pictures, her coat is changing and getting very wavy it' just beautiful! I might have to send the pictures separately since I'm using my Ipad. Looks like you will be very busy with new puppies. Beautiful new dogs you've acquired. I look forward to seeing pictures! "He has been more than I expected out of a pet. He is my soul and friend. Too embarrassed to say he sleeps with me at night. Except when it get too warm , then he finds some tile to lay on. I keep up with his health and make sure he gets fed properly. We take long walks daily and I take him to the country once a week, sometimes twice to get a good run. I have never been out so much. Good for me. This coming July, he will be two. He gets complements all the time. So great with people and especially kids. He thinks kids are toys for him. So gentle. Thank you for introducing us. Best thing in my life. Ben (aka Tyson) is just doing absolutely marvellous. We have sit down very very well, is also sitting and waiting for his food. We are walking very well on the leash, that just came yesterday and now he thinks he's a pro, with exception to leaving the house......believe it or not, we have to bring his friend, Mr. Moose, the stuffed toy that you saw when we picked him up. Once he sees he's coming, and I carry him with me, he walks just fine. We are taking 2 to 3 short walks a day and he is learning all sorts of new things along the way. Is a bit nervous when cars go by, but is feeling better each day and so is Mr. Moose. 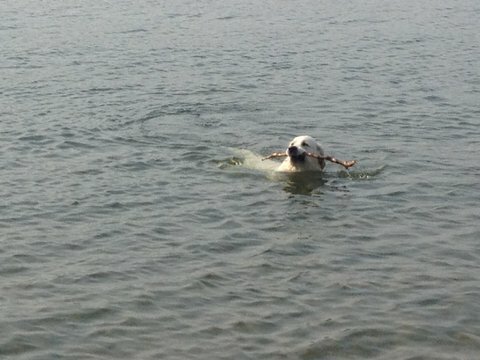 LOVES water. We had a rain storm here this morning and he found the down spout and thought it was the neatest thing. Head was in and then he would run around and go back for more. Is very good at greeting people and is not shy at all. His potty training is going very well. Is now walking to the doors or whining when he needs to go out. We have been diligent in taking him out every hour or 2 hours and this seems to be working great. I have attached a video we took last night....I hope it's not to big for you to receive it. He is growing it seems every day and is our sunshine every morning. It is so wonderful for wake up and see his face and tail wagging and lots of love. We are just thrilled with him Judy. We just can't thank you enough for giving us such a wonderful little man. Today was the first day we are working on down, as you mention below, we work on commands 3 times a day, just before feedings I find is the best time as he is so attentive at this time. As well, I am starting to work on him to not "chew" hands or toes. He is not bad and never is hard but wanting him to socialize with kids and would be feeling more comfortable he won't pinch or hurt them. He is starting to learn what "no" means and is does not resist at all. Loving life with him and all he is bringing us. It is truly wonderful to have 4 paws back in the house. Thank you again for all you are doing. 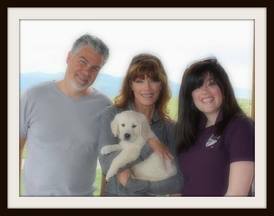 My family and our little pup Ben can't say enough about Judy, Judy's wonderful breeding program and the extended training video sessions as well as the Webinar's she has provided our family to help us make our pup the best dog he can be. 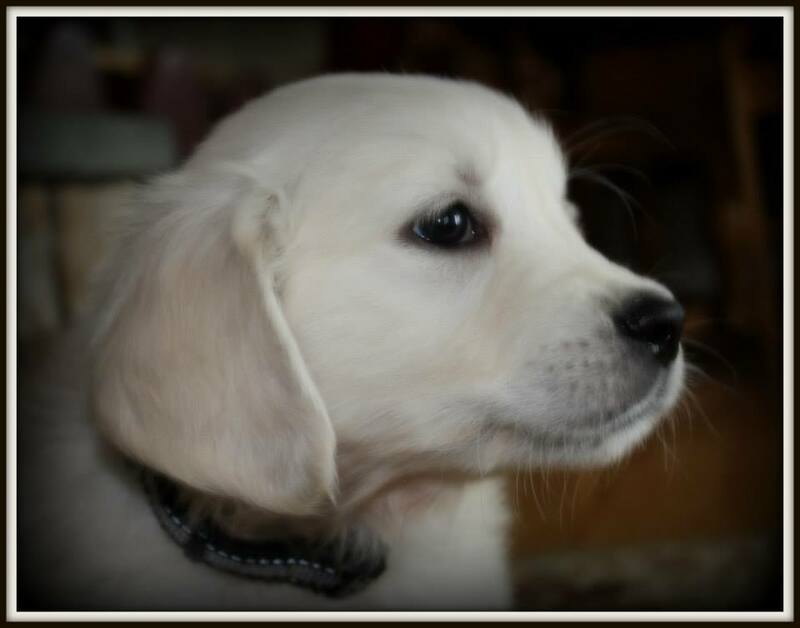 Right from when we picked up our wonderful puppy, Judy had prepared and started us out on a comprehensive and oh so easy to follow step by step set of instructional videos as well as activity sheets that match the videos. These weekly video's and activity sheets walked us through step by step what our or your puppy can and should be capable of doing at that stage of his early puppy hood. These videos are easy to follow and very detailed as Judy shows in these training techniques one of her puppies that is roughly the same age as your puppy. Seeing her puppy being able to perform these tasks of sit, stay, come etc. at such an early age, encouraged us want to guide our little guy that much more. He was extremely responsive and very eager to learn more and more. Also, what can't be said enough are the bi-weekly Webinars that Judy has arranged for us to dial in to listen to various topics discussed with a professional dog trainer that has many years experience and expertise. Topics including all about puppy hood and what to expect, food aggressiveness and how to curb or cure it, separation anxiety and what to do and what to look for as well as always a question and answer portion at the end of each session. Each session is a new topic that the trainer and Judy have put together to provide the most jammed packed informative 60 minutes they possibly can. 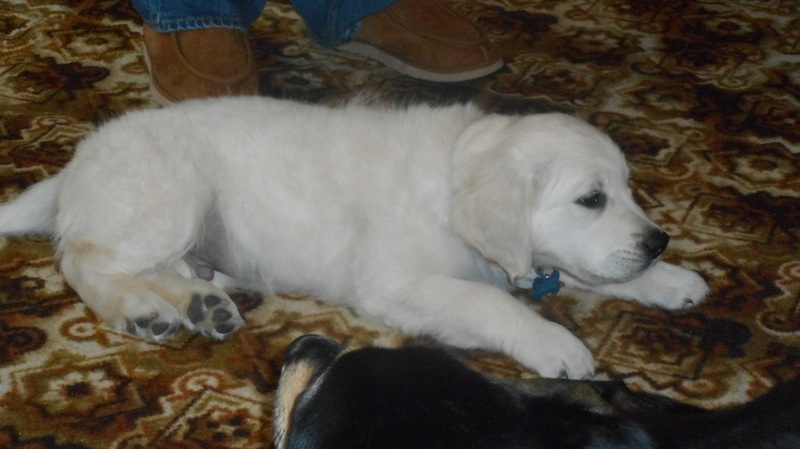 The wealth of knowledge that we have learned and applied or can relate to from having past dog members in the family is so vast that we have found it an extremely valuable source to help make our new pup a very happy and healthy dog. As Judy always says at the end of each of her training sessions," keep training, keep bonding and have fun", we have been training which has made us bond and we have had so much fun in the process. We truly can not thank Judy enough for all her hard work and effort and interest to make the best start as well as future in our Ben's canine citizenship. All the very best to Judy and her future "students". They couldn't have a better teacher or start to life. 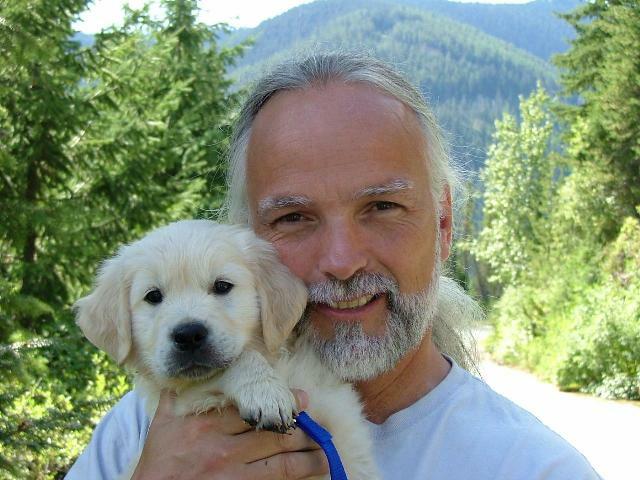 We're happy to give a testimonial on the Canine Coach Training program. Even after having raised several puppies, the Canine Coach was a tremendous help to us, not only in reminding us of the importance of beginning the training immediately, it offered many tips and procedures, as well as commands that were so much more effective than the ones we were familiar with. Seeing a video of the actual training process was very helpful, as well as having the written lessons to refer back to for quick reference. 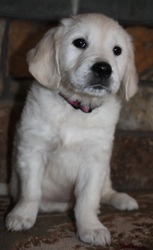 Our puppy has responded very well and is on her way to being a well-mannered member of our family. The on-going support that Judy has given and still gives, is invaluable. 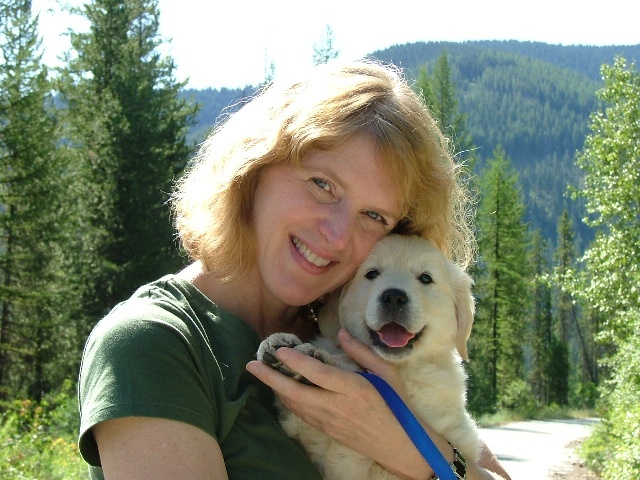 She clearly has great compassion for her puppies and is committed to providing all the tools for new puppy parents to teach and learn as their puppies grow. Thanks for providing this much needed program for all of us! 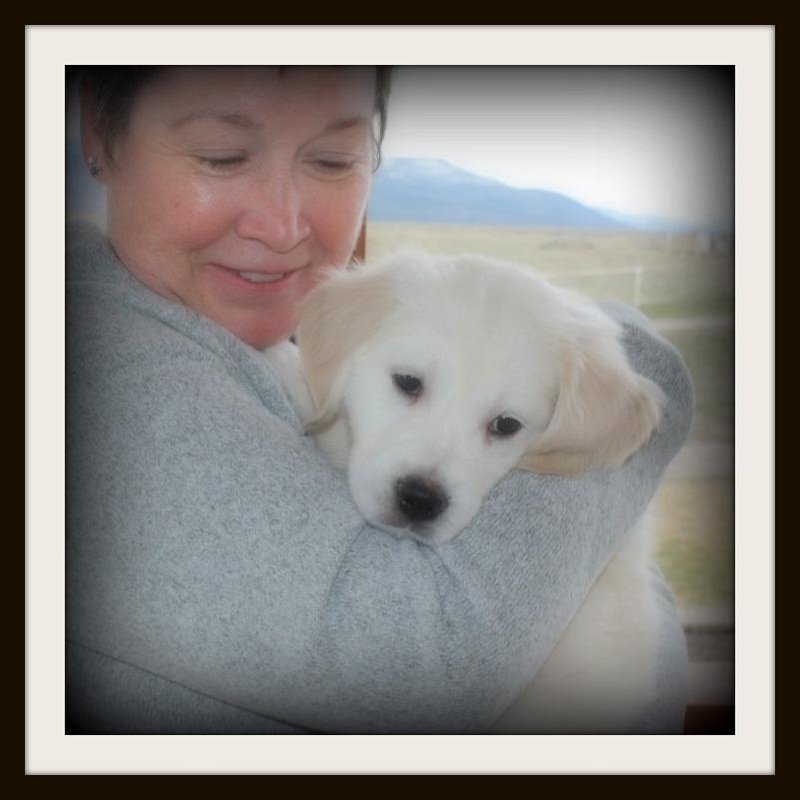 Lini Reading (Montana Mist Golden's Breeding Program Manager) is an absolute ANGEL! My Amazing Grace was treated with such love; by Lini, her daughter, the 10 year old Puppy Socializers & her hockey team members. Her garage is a Puppy Palace, spacious, securely enclosed, warm (winter), clean, smells good, equipped with a litter box, mattress, old sofa, food & water dishes, and many, many toys that stimulate the puppies intelligence. Her backyard is fully fenced for healthy, outdoor play, and her home has a very clean & cozy, expandable whelping box for mama Isya & her pups. Less than a week after I brought Grace to my home, a good friend's dog bit her on the nose & it became infected. Lini was right there on the phone with me, assuring me that she understood my grief & worry, and that everything was going to be ok. When Lini so lovingly brought Grace's brother to Seattle on the plane for another family, she made contact with me & we met for her to see Grace again. As you can see, my sweet, smart, beautiful Gracie was incredibly well loved & knew simple commands of sit, down & high five, which is outstanding for an 8 week old puppy! She had all vaccinations, dew class removed & was microchipped by the wonderful vet & techs in Whitefish whom I met the day Grace became "mine." Lini loves all her puppies & her own 4 dogs with all of her heart ❤️. And I love Lini! 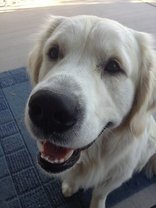 ​Our family has owned registered golden retrievers over for 30 years. 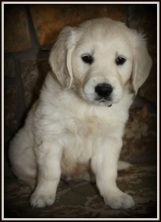 Without question, Montana Mist Goldens is the most professional breeder I have encountered during this time. Lini was our primary contact after the pups were born. Lini is also a professional. It is apparent she has a loving heart. Our pups had the best start in life due to her care. When I had a question, Lini responded immediately. 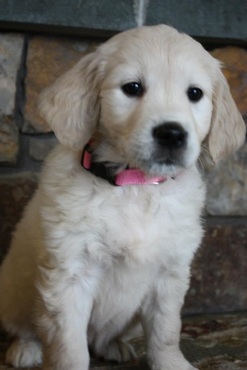 She has a delightful personality and was a highlight of of our experience with Montana Mist Goldens. 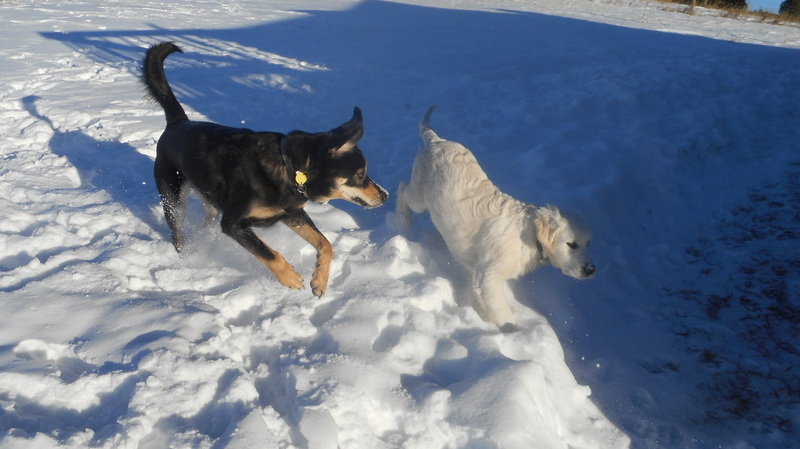 Super Sabre (4 months) and Airborne Ranger at Dad's ranch!! Sabre is just learning to do more than just the "puppy run" and actually RUN!! He has to as Ranger can really fly!! Sabre is just beautiful, very calm and loving, but plays SO HARD with Ranger and Dad's puppy, almost a Jekyll & Hyde thing!! He does Service Training like it is nothing!!!! Very smart and VERY willing to learn!!! He is an exceptional puppy!!!! **Words cannot express what Judy and Lini (Montana Mist) did for our family, and I still find it hard to believe they donated Super Sabre to us!!! He is really an exceptional puppy, easy to train, easy to take care of (except for a strong desire to crawl into the tub when I'm in it!!) 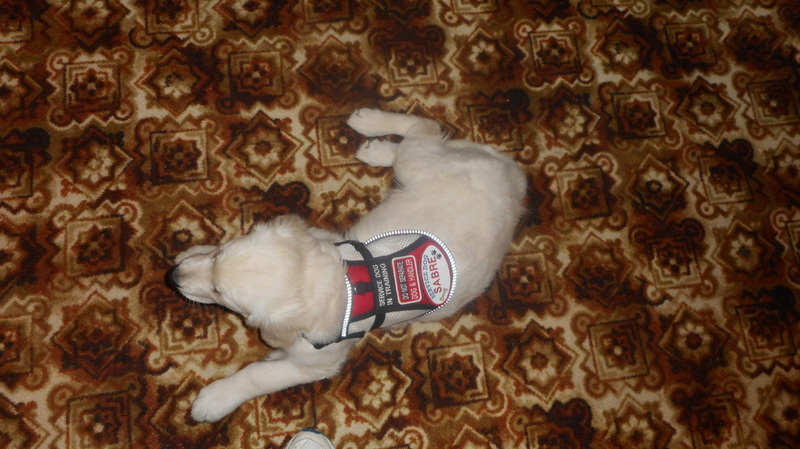 he is already going places in his Training Vest, and is thrilled to meet people while out!! Montana Mist, from day one of learning of our loss of my wife's service golden (Théoden, 4 1/2 Years old, way too young)) has went above and beyond to help our little family recover and gave us a GREAT gift!!! From donating to the day we picked him up, they were so AWESOME I actually do not know how to express how I feel. You guys are the BEST!!!!! 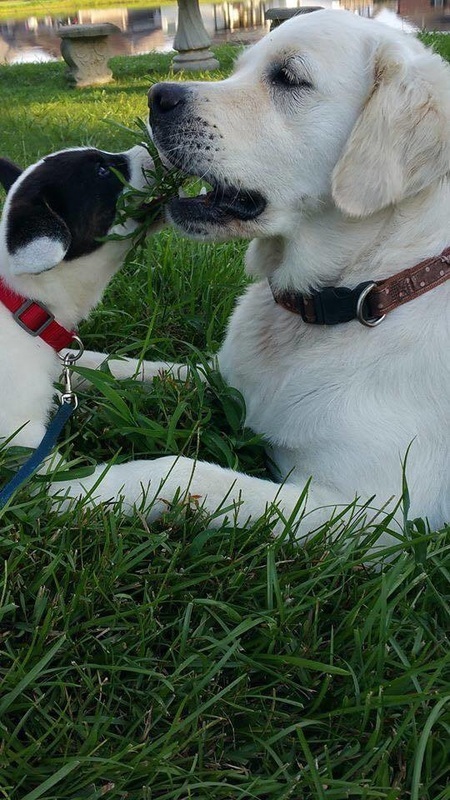 ​Judy, Bentley is definitely food motivated. He will sit, go down, wait, and walk on a leash although he likes to pull. He will wait for his food until I release him, will wait at the door if I command him. 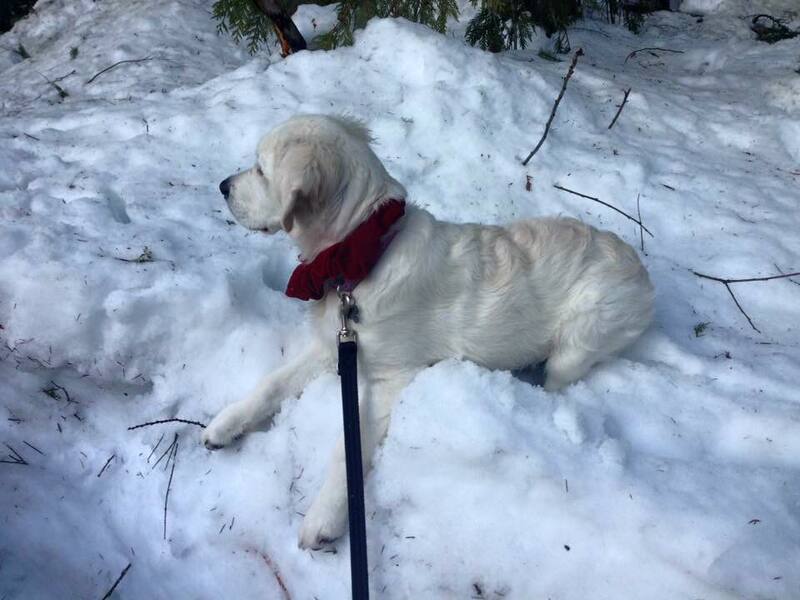 But when I free him for walks on the mountain trail, and he sees another person or pet, he goes ape and is so excited to play, he can'€™t help himself from jumping up. When walking, he does not like getting out of my site when he is free, but I see him spreading his wings as he gets bigger, liking to explore more and more. He is a good pooch. Many comments about the beautiful dog. Zeus is doing great, He is such a wonderful addition to our family. He is so loving and calm and doing amazing with his training! He pick things up so fast. We are so happy with the addition to our family. We were a little hesitant Â about bringing a puppy into the house with a 18 month old toddler running around. They are absolute buddies! He is so good with her. When you said your bread calm dogs, you were not kidding, I can't believe how many compliments I get from people on how calm Zeus is. Of course, we can't go anywhere without being stopped and told how gorgeous he is! The vet and dog trainer have also commented on how calm he is for a Retriever. 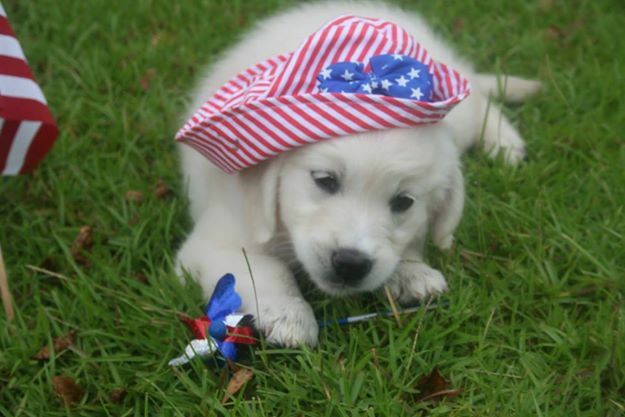 Our experience purchasing this puppy from you has been exceptional. It shows how much you care about these puppies and the families they are going to.